From materials to design services and fabrication, Niantic Seal has worked closely with the Electronics and Semiconductor Industry to solve critical sealing applications. Whether sealing in wet or dry processes, Niantic Seal technical sales can design specific geometries in a wide range of elastomers. The semiconductor manufacturing process is a harsh environment and seals need to withstand highly corrosive liquids, gases and plasmas, at extreme temperatures or in a vacuum. Niantic’s goal is to maximize the performance of semiconductor manufacturing equipment, increase service life and extend time between planned maintenance, thereby minimizing our customers overall cost. DuPont Performance Elastomers offers the broadest range of specialty elastomers designed specifically for the semiconductor industry. Kalrez® offers high performance sealing with perfluoroelastomer parts for reduced contamination and longer seal life in aggressive wafer manufacturing environments. Chemical resistance coupled with superior high-temperature properties, ensure Kalrez® parts will withstand any process media, including plasma with various gases at temperatures up to 325°C (617°F). 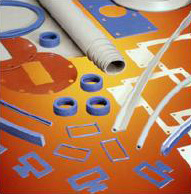 Parker Seal Parofluor® O-rings in perfluoro rubber (FFKM). High resistance to nearly all chemicals at temperatures from –30 to +310 °C. Ideal for use in components and subsystems within many semiconductor and electronics applications. As a fluoroelastomer seal, OmniFlex® provides exceptional performance in corrosive environments and in extreme operating temperatures. OmniFlex has an outstanding low temperature performance of -57°C (-70°F) which outperforms any elastomer, with a maximum temperature of +218°F (+424°F). With its softer durometer, OmniFlex is an excellent choice for low friction hydraulic seals and standard o-rings. Special shapes can easily be manufactured to dimensional tolerances, which include standard o-rings in metric, JIS, AS568 Standard or unique sizes. TFE-O-SIL silicone, Viton® or EPDM O-Rings encapsulated with FEP or PFA are designed to address the growing problem of sealing in the most hostile chemical and temperature environments. TFE-O-SIL combines the best qualities of two materials, FEP or PFA on the outside with its chemical inertness and an elastomer on the inside for resilience. This unique combination forms a highly effective, long lasting seal for the most demanding applications. Niantic is a leading fabricator for Chomerics EMI/RFI materials. Niantic Seal is equipped to react quickly to unique challenges, with fabricating capabilities that produce prototypes quickly. These prototypes allow our customers to evaluate performance improvements and reduce costly design flaws, so that your final product is the most successful and cost-effective solution possible.